Want to use herbal extracts … but not if they're alcohol-based? Herbal extracts are arguably the most potent way to deliver the healing and balancing benefits of herbs to our bodies. Yet, what if you can't or don't want to consume alcohol — or give it to your kids? Are you out of luck? Absolutely not! Because… you can make a glycerin-based, alcohol-free herbal extract — also known as an herbal glycerite. Although they aren't quite as potent nor long-lasting as alcohol-based tinctures, glycerites are faster to make. While an alcohol-based tincture will take 6 to 8 weeks, a glycerin-based, non-alcoholic herbal extract takes just 3 days. And, they taste better because they're sweet. Which means kids often love taking them — instead of complaining about them! Making your own herbal glycerite may seem overwhelming, but it doesn’t have to be. Homemade glycerites are also much easier on the pocketbook. Store-bought ones are easily $8 dollars per 4-ounce bottle, while it costs $8 to make an entire quart or more of the homemade stuff. Sometimes I have to make it right then and there (after doing some research) — and glycerites take just 3 days. But lately I'm all about stocking up on the tinctures that are going to help with daily life, illness, and things that we just know come up in our family. I make a feverfew and white willow bark glycerin extract that's been so helpful for preventing and handling headaches and migraines, among other things. I especially love herbal tinctures for delivering the benefits of adaptogenic herbs. 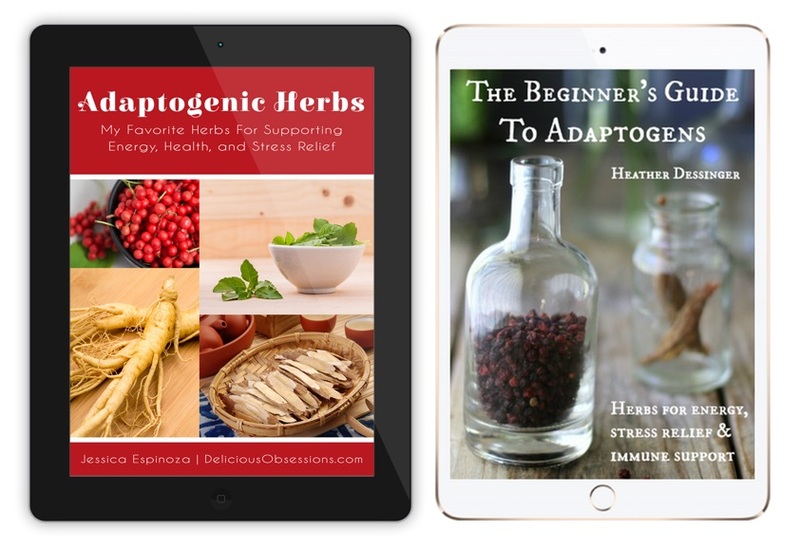 Adaptogens are a special class of herbs that help with stress, vitality, and overall balancing of your body. They're fascinating and powerful! 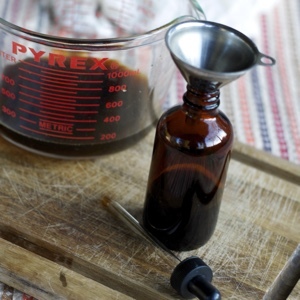 And Finally, Here's The Alcohol-Free Herbal Extract — or Herbal Glycerite — Recipe! Herbal extracts are arguably the most potent way to deliver the healing and balancing benefits of herbs to our bodies. And, compared with alcohol-based tinctures, herbal glycerites are faster to make, alcohol-free, and taste better. A plus for kids! Keeps 3 to 5 years. 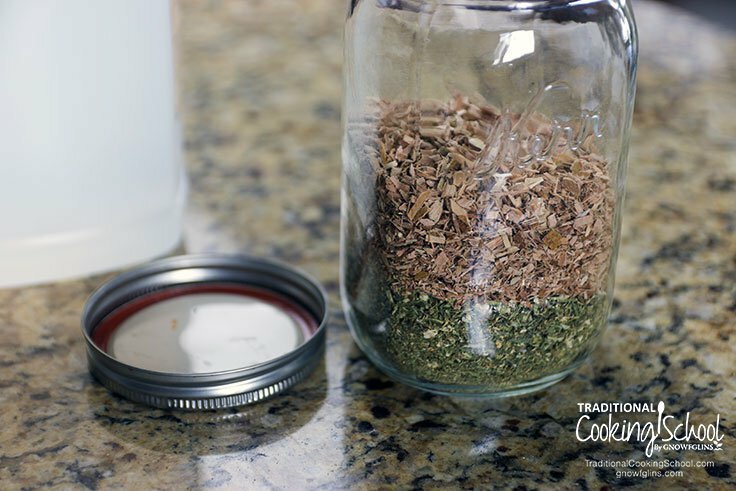 Put herbs in quart size Mason jar to 1/3 full (for dried soft herbs) or 1/2 full (for dried hard herbs) -- not packed down. Then pour a bit of boiling water over the herbs to help release nutrients (optional). Pour glycerin over all to fill the jar to just below the bands. You may have to add glycerin a bit at a time and stir with a spoon to help it soak down in. It's so thick! Then cover the jar with a metal band and lid and screw down tightly (so nothing leaks during the cooking). Put a towel on the bottom of the pot (whichever you're using). Put the jar(s) on top of the towel. Then fill the pot to the shoulders of the jar(s) with water. Turn off crockpot or Instant Pot. The glycerin should be quite dark now from the herbs. Then put the strainer over a big bowl or pot. 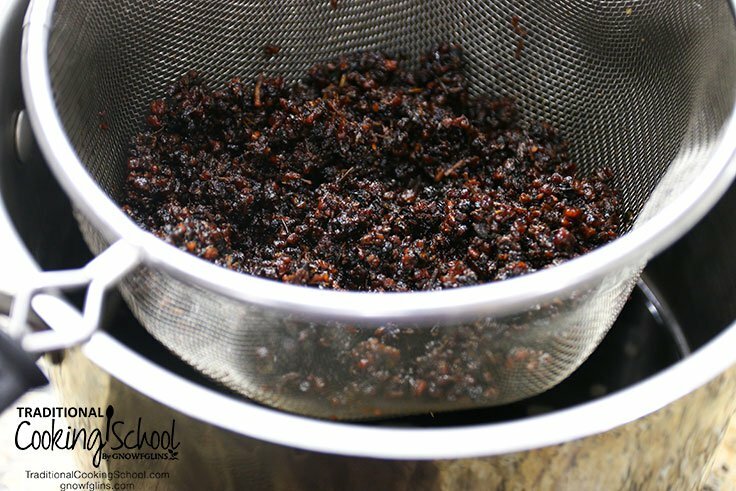 Dump the contents of one jar into the strainer and let the liquid drip into the pot. Then stir with a big spoon to help the herbs drip out fully, and also press the herbs with the spoon to squeeze out as much glycerin as you can. You can also use your hands and squeeze! Then pour the finished glycerite into a glass jar and cover tightly. Or you can use a funnel and separate into 2- or 4-ounce amber dropper bottles. Finally, store in a cool, dark location. Even better to keep in the refrigerator. 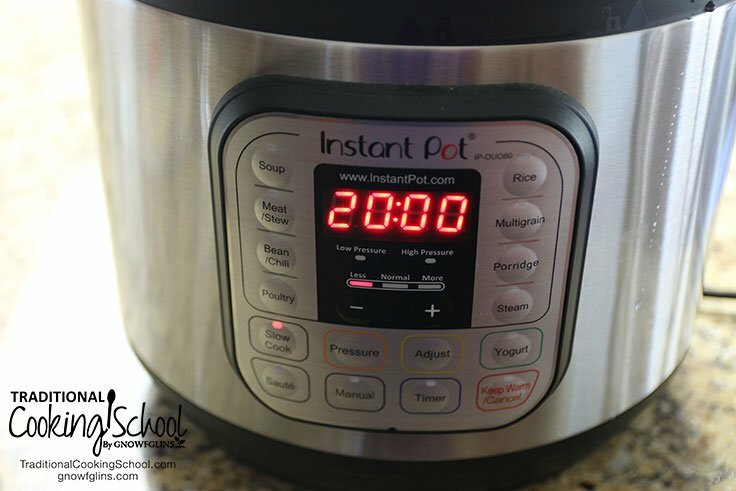 *You need a slow cooker setting, which means you need a crockpot or an Instant Pot. I make these 2 to 3 quarts at a time inside my 8-quart Instant Pot (you can fit up to 3 quart jars). The quart jars do not fit in a 6-quart Instant Pot, but you could scale down to pint jars instead if you're using the 6-quart Instant Pot. 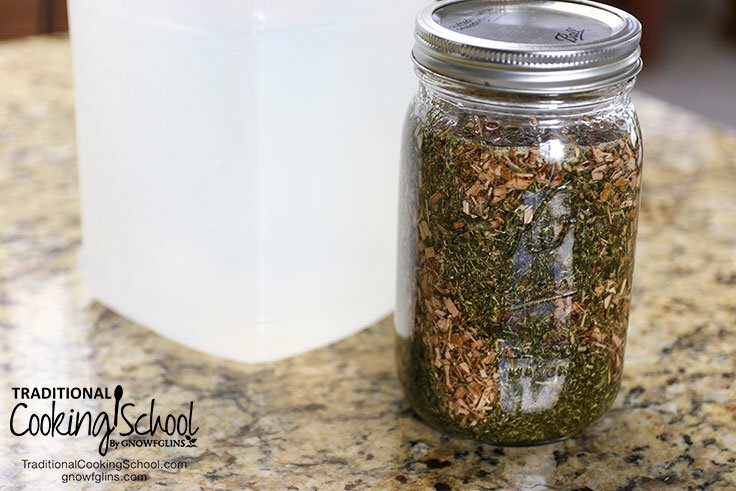 Do you make or use glycerin-based, non-alcoholic herbal extracts (herbal glycerites) at home? What are your favorite herbs and how do you use them? Oh wow. I have never seen this done. This is really good to know! Thanks Katie! I’ve done glycerites before, but it never occurred to me to heat it gently to speed up the process – that’s a great improvement! I’m wondering about herbs that extract better with alcohol and not so well with glycerin – what would be the procedure for tincturing in alcohol, and then evaporating the alcohol and replacing it with glycerin? There are instructions on how to tincture in alcohol, then replace/evaporate the alcohol with glycerin, in The Herbal Medicine-Maker’s Handbook. I’m glad to have this with the links. I have heard of making a tincture with alcohol as well as one with glycerin and combining the two to make something more palatable as well as using the stronger extractive power of the alcohol. I do that sometimes as well. 1. You say in the paragraph below to let them steep for six weeks, and then below that you say to place them in a crock pot? Which is it? Six weeks and then 3 days in the crock pot or is it six week OR the crock pot. 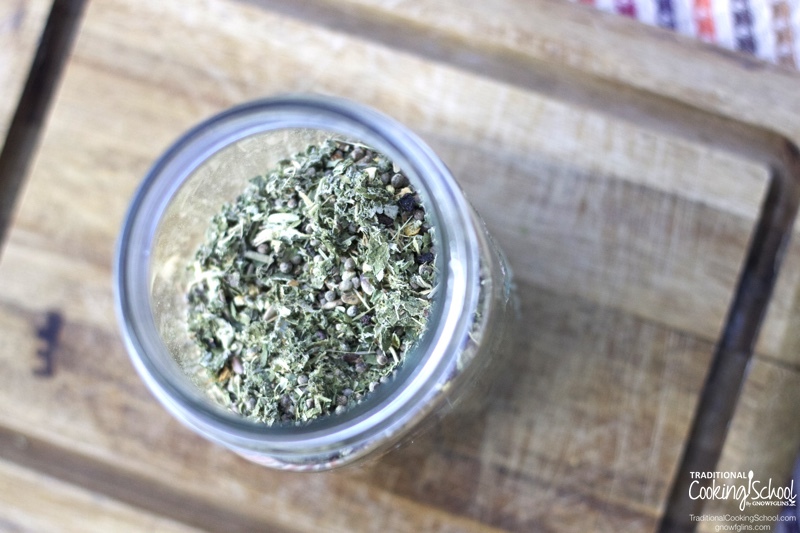 Steep the herbs by storing them in a dark place (such as a cabinet) for six weeks, shaking every day. 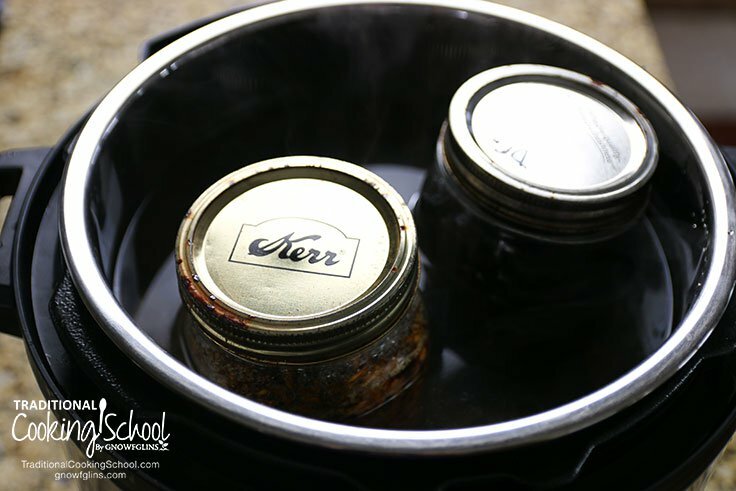 Or, if you want to use the glycerite sooner, carefully nestle the jar in the bottom of a crockpot and add water until just an inch of the jar remains uncovered. Place lid on crockpot and cook on warm to low for 3 days. Turn off at night if you think your crockpot gets too warm. 2. Are those made with alcohol more potent than those made with glycerine? I’ve head that and because I’d like to make potent tinctures, I’ve avoided using glycerine, and won’t use alcohol. So what’s the truth about potency? I am so sorry that I missed this! It is either or. Generally speaking, most alcohol tinctures are more potent. There are some herbs that do better with glycerine. For myself, I use the alcohol based ones more often. Honestly, I am not sure what the measurements would be for powders. Powders not a good choice for this though because it is almost impossible to strain out all the powder. 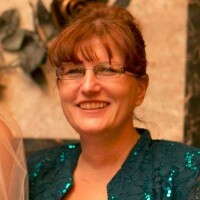 I have no experience making propolis tinctures, so I am not able to advise you on that. I am sorry. What would be the shelf life of these glycerites? Have you ever tried glycerites in an instant pot or would it get too hot? Neat. How long did you slow cook them for? Hi – and question about the step number 15 – of Pour some boiling water over the herbs to help rinse all the glycerin off. — so, do I understand correctly that there’s no real concern about the diluting effect of that rinse water being added to the drained product from the steeping??? Is there some measure of water that is acceptable, or how does that piece fit? Thanks! Diluting is fine. You use as little as you need to rinse it off the herbs; otherwise it gets wasted because it won’t come off the herbs. Two things I question. The addition of water and not storing the finished product in the fridge. Both seem to open the product up to bacteria growth. I always err on the side of caution. I always keep my alcohol tinctures in a cool place and the glycerin ones in the fridge unless I using them up pretty quickly. I have seen recipes where you add a little water at the beginning to help extract (which I don’t do) but never when the herbs are being strained. Thanks! If you can strain the herbs fully without the additional water, that is fine. Wardee does use a bit to help get the last bit of infused glycerine off the herbs (otherwise it is wasted). About how long does a glycerin based tincture last in the fridge? I would recommend creating a base of 70% glycerin and 30% distilled water as the base. Covering the herbs with that base and letting it sit for 3 days in a crock pot. Strain, and keep in the fridge. This way, you would avoid having to add water at the end. Also, I feel that if you add water, it’s best to add DI water after it was boiled to insure you killed most of the bacteria. Another idea is if you would like to make your ticture extra strong, do this procedure twice. 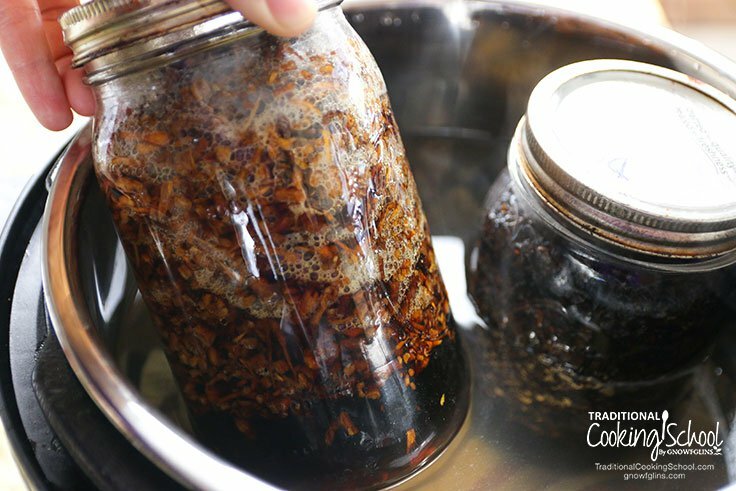 Use the herbal extract that you get from your 1st batch as your base liquid for filling again a mason jar with the herbs and let it sit for additonal 3 days in the crock pot. Now, you will have a much stronger tincture. Thank you for this post. Hey there! 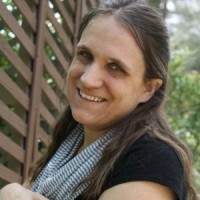 Question, I am doing the tincture for the purpose of detoxing my liver, and After reading someones comment about how glycerin tinctures bypass the liver and only alcohol tinctures will work for that, I am convinced I need to use alcohol instead. Problem is, I dont want to use any alcohol produced via grain. That cuts out any type of strong, concentrated alcohol product that i know of (such as vodka) and something that has no added preservatives, sugars, colors etc….. With that said, The only alcoholic drink i can think of that fits the bill is Crispins Hard Cider products. However, the alcohol proof in that is EXTREMELY lower than vodka by a long way. But the question is… would it still work in place of glycerin and vodka? If so, how would i even go about using it? Thanks. This is an example of a tincture made with ACV. I think it could be adapted here. Could I use raw apple cider vinegar in place of the glycerin or alcohol options? I recently made a glycerine tincture and placed my jars in a crock pot on warm for 12 hours. Should I remake them or do you think they will be strong enough? I don’t know for sure, but since our recipe calls for 3 days, I myself would put them back in. It’s hard to tell in the recipe, but is the lid supposed to be on the crockpot/instapot? In the pics it looks like the lid is off, while cooking. Just confirming. Hello, thank you for very helpful directions. Althugh I would like to ask, what is approximate temperature of “slow heat” for three days? I am using just stove cooker in the water bath and wanna make sure I won´t let the extracts overcooked! Thank you very much! The temperature for slow cooking the herbal extract is approximately 200 degree. How do I know what to use glycerin, alcohol or vinegar to extract my plant. I know that alcohol and vinegar are good to extract the alkaloids and some of the terpenes. Please correct me if I’m wrong. How about the glycerine, what does it help to extract?